ENSCO supplies both commercial rail and government entities with engineering solutions to meet their needs. 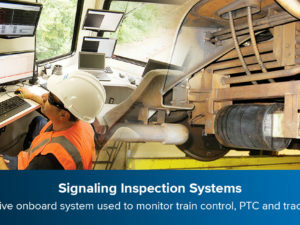 Our engineers have pioneered the use of technologies to improve track maintenance, such as advanced rail inspection sensors, high resolution machine vision track imaging technology, autonomous inspection systems, and signaling system inspection. These technologies provide customers with the best possible tools to ensure track and rolling stock safety, increase productivity and efficiency, and reduce operating costs. ENSCO is a recognized producer and pioneer in the field of track inspection vehicles and measuring systems. 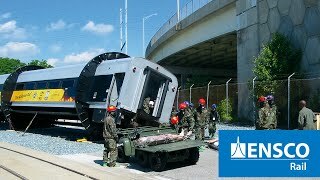 It is the sole supplier and operator for all track inspection vehicles used by the Federal Railroad Administration (FRA) to enforce track safety standards on U.S. railroads. ENSCO’s state-of-the-art solutions have been delivered throughout the world for both high-speed and conventional railroads. ENSCO is the established leader in autonomous track inspection. As railroads increase axle loads, train frequencies, and operating speeds, they face higher rates of infrastructure degradation, and therefore require more frequent inspection. To meet this increased demand without the need for specialized vehicles or staff, ENSCO delivers sensor platforms on revenue cars. These automated systems integrate the most advanced technical inspection technologies, including high-accuracy GPS, wireless communications, and enterprise web-based data management systems. ENSCO currently has more than 400 autonomous inspection systems deployed around the world with sensor platforms capable of evaluating vehicle/track interaction and track geometry parameters. ENSCO’s expertise with high resolution camera systems and advanced image processing algorithms results in systems with extremely reliable image acquisition and processing capabilities. This approach has been successfully applied to the inspection of a range of track components, including joint bars (fish plates), ties, fasteners, rail heads, overhead wire, as well as track right-of-way (ROW). All ENSCO rail track imaging systems can operate either day or night to reduce operational interruptions. ENSCO’s track inspection Data Management Suite provides a fully integrated offering of our data management and analysis software packages. The suite is comprised of the Digital Track Notebook® (DTN), TrackIT®, Automated Maintenance Advisor (AMA), Virtual Track Walk™ (VTW), GeoEdit 8, and VAMPIRE®. ENSCO’s Data Management Suite uses common architecture, data structures, and asset databases to enable cross communication of the systems to achieve advanced capabilities. The web-based applications, i.e., DTN, TrackIT, and AMA, are seamlessly integrated into one user interface. Customers can use ENSCO’s software packages individually, or combinations of applications in the track inspection Data Management Suite. ENSCO employs one of the largest groups of vehicle/track interaction specialists in the world – leading the way in vehicle acceptance testing, vehicle dynamics analysis, and derailment prevention. ENSCO’s close understanding of the relationship of the vehicle/track interaction and regulation enables it to deliver comprehensive, cost-saving recommendations when upgrading lines to higher speeds, implementing corrective actions to improve ride quality, and vehicle stability, and optimizing wheel/rail profile design. 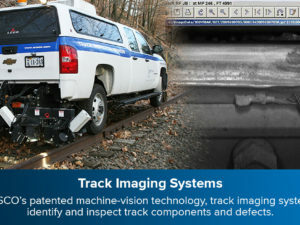 ENSCO is unique in its ability to deliver a comprehensive range of railway safety solutions, including non-contact rail and track measurement systems, tools for track inspectors, asset management systems, comprehensive vehicle/track condition assessment consulting services, and rail safety and security services. ENSCO’s track inspection specialists are dedicated to the development of new technologies to improve the safety and efficiency of rail transportation. Customers benefit not only from decades of acquired experience and practical knowledge, but also from direct access to emerging technologies tailored to fit the customers’ needs. Rail customers come to ENSCO because of its solid reputation for research, development and innovation. ENSCO continually strives to deliver flexible and adaptable solutions that take advantage of developing technology advances. ENSCO is the world leader in railway inspection sensor platforms and has consistently developed new and innovative technologies evolving from industry needs for more than four decades. Our goal is to remain number one in the industry through expansion of sensor platforms to increase detection capabilities, as well as the integration of important technologies from our defense and aerospace businesses, such as big data analytics and unmanned aircraft systems to create exciting new offerings for our railway customers.